For the First Cyrodilic Empire, see Alessian Empire. The First Empire of the Nords is the collective term for the Nordic kingdom during a phase of expansion in the First Era, known as the Skyrim Conquests. Its capital was the city of Windhelm in Skyrim, where a First Empire palace still stands. The empire was formed when King Vrage the Gifted began a campaign to conquer High Rock and Morrowind (a feat that is attributed by some to Sai, the God of Luck) circa 1E 240. 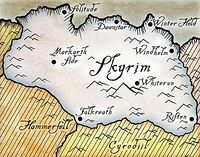 By the end of the conquests, the First Empire of the Nords encompassed Skyrim, High Rock, Morrowind with the exception of the Dwemer kingdom of Vvardenfell, and a large portion of Cyrodiil's Nibenay Valley. These invasions upset the balance in High Rock and Cyrodiil, and although the Nords' empire lasted less than two centuries, the result was decisive; from then on, power in those regions shifted from the elves to the humans. Though the last ruler, King Borgas, died in 1E 369, the ultimate end of the First Nordic Empire came in 1E 420, when the Pact of Chieftains ended the War of Succession and the empire finally shattered; Skyrim eventually lost all of its holdings in Morrowind, Cyrodiil, and High Rock, and many of the Nordic kingdoms began to declare independence. The Nords were driven from Morrowind by force when Indoril Nerevar and Dumac Dwarfking joined together, repelling the invaders in 1E 416. The Western Reach in High Rock was retaken by the Aldmer. Before long, Skyrim was more divided than it had been in centuries.